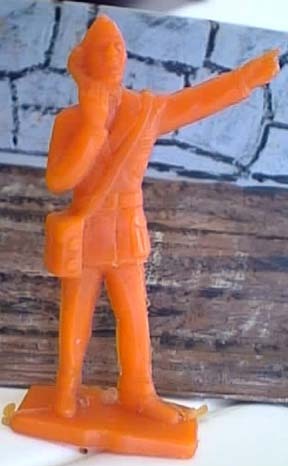 East German Infantry, these guys are about 65mm in height and were manufactured before the Berlin Wall came down (hence East Germany), they are molded in a rubbery plastic and have a basic paint job. I think a few more poses exist. 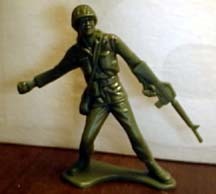 The Processed Plastic Company has been producing these "Viet Nam Era" troops for over 25 years. A change occurred somewhere in the 80's which altered the grenade thrower to have an open hand instead of a fistful of high explosive. Both are excellent figures. The high number and generic uniform/gear of these guys lends them easily to conversions. 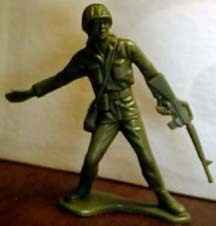 PPC also produced this "sentry" figure, walking at sling arms. This guy is no longer found in the PPC bags, he must be out of production. 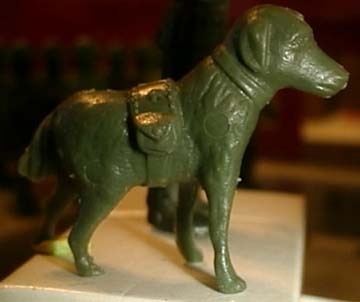 The Timmee Medic Dog...this pooch came with the medical set...he is molded in Olive Drab and has a medical pouch over his back...the pouch has crosses molded on them, I have the same dog with no pouches molded in black, if I can find him, I will put him on the page. I got this guy from the UK on Ebay recently. He looks like an Air Raid Warden. can anybody help ID these guys?